In this tense and immersive tour de force, WHEN TWO WORLDS COLLIDE brings audiences directly into the line of fire between two powerful, opposing Peruvian factions who will stop at nothing to keep their respective goals intact. On one side is President Alan Garcia and the Peruvian government who, eager to enter the world stage, begin aggressively extracting oil, minerals, and gas from untouched indigenous Amazonian land. They are quickly met with fierce opposition from the indigenous people living in the Amazon jungle, led by Alberto Pizango, whose impassioned speeches against Garcia’s destructive actions become a rallying cry. When President Garcia continues to ignore their pleas, a tense war of words erupts into deadly violence, bloody protests and chaotic clashes between both sides. 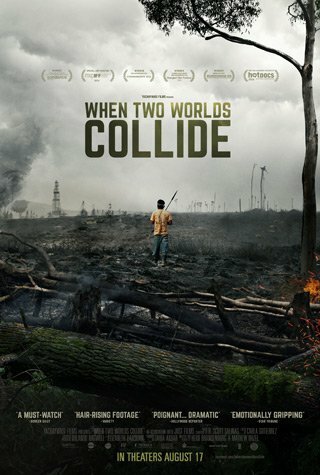 First-time feature documentary filmmakers Heidi Brandenburg and Mathew Orzel capture all angles of this volatile political and environmental crisis with breathtaking access and bold, unflinching camera work. From the raucous halls of justice to deep in the heart of the Amazon jungle, WHEN TWO WORLDS COLLIDE exposes a titanic clash between a government hungry for economic legitimacy and a people, led by an outspoken environmentalist, desperate to protect an ancient land from ruin. The filmmakers immersed themselves in Peru for several years to flesh out this complex story. Their close relationship with Pizango, an eye for Amazonian beauty, and no-holds-barred interviews with Peru’s political cupola come together to create a heart-pumping tale of defiance and courage. The film captures this continuously important story linking indigenous rights and the sustainability of the Amazon rainforest told against the backdrop of globalization.